Countless people showed up to vote on election day only to be turned away for not being on the register. For our reporter, his quest to vote fast turned into a long and fruitless search for his name. It was a clear morning on election day and I lined up at my respective polling station to cast my vote. As I waited for my turn, I felt both excited and anxious. It was that nervous feeling that something bad was going to happen today. But at that moment I did not know that this ‘bad’ thing was going to happen to me. My polling station was at the Faith Trust Primary School, Kawotto in Kajjansi. 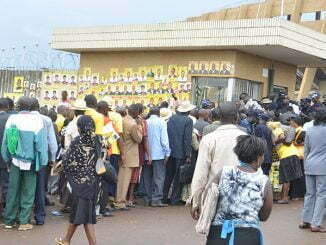 At the time there were less than 50 people queuing to vote. This is the same polling station I voted from in 2006. I approach the table where officials are checking the register and handed them my voters card. After ten minutes I was told by the officials that I am not on their register. “Please try the next polling station at Kitende Church of Uganda,” was the advice from one lady at the checking bench. How could it be that despite the fact that I have a voters’ card issued on January 3, 2006 I am not on the voters’ register? The next polling station I was referred to is about a kilometre from Faith Trust. I walked there and after queuing for ten minutes I was told that my name was not on their register either. “Try thenext station along Entebbe road,” I was further advised. My experience was not any different from many other registered voters in various parts of the country who could not cast their vote on election day. Clovice Nyakatura from Makindye Division had a similar story to tell after visiting two polling stations without finding his name on any of the registers. “I went to the first polling station at the Gombolala where I was directed by a police officer to join the line where my name was meant to be listed. But after lining for 20 minutes I was told my name was not there,” said Nyakatura. Nyakatura was advised to check with the Electoral Commission official that was handling the complaints. The official had left the station and was due to return after midday, it was now 9am. Nyakatura jumped on a boda boda to the next station which was about a kilometre away but found his name missing again from the register. He lost patience and gave up participating in the vote. One possible reason for his name missing from the register is that he transferred from Kabale to Makindye- Madirissa zone but Nyakatura insisted he filled out the proper paperwork. Leyah, another voter from Mukono who preferred to give only her first name also found her name missing from the voters’ register. She had transferred her name at the EC from her last polling station in Bugolobi a year before. “I showed up that morning and I was told that I was not on the register. I was told to try another station but my name was not there either. There were a lot of people like me who could not vote that day,” said Leyah. 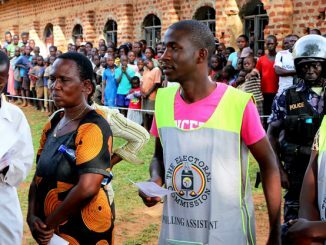 At Seeta Church of Uganda, an estimated 200 people gathered outside the polling station after finding their names not on the register. It took the intervention of the police to calm down the group. Many in the group suspected they were intentionally disenfranchised since Seeta is a well-known opposition area. 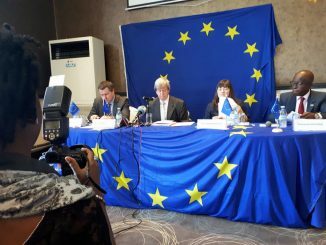 While there is no official record yet from the public or the Electoral Commission about the disenfranchised voters, there are numerous complaints of individuals missing voting all around the country. From the National Voters’ Register Online, Sorry! The Voter ID entered seems not to exist in the system.” The following day I called the Electoral Commission and was advised to go and check with the data section which I did, getting a verbal confirmation from one of the staff that my name was indeed on the register. When I insisted on knowing the polling station she advised me to go to where I collected my voter’s card from. With that assurance, I went to the polling station to cast my votes but it only turned into a walking and boda boda riding session as I travelled from one station to another in search of my name. I went to Water Polling Station Kitende, then Sissa Gombolola polling station, from where I proceeded to Muwana Polling station which is about four kilometers away from the previous two. It was now past midday and I was still looking for my name and I could not find it anywhere. I gave it another shot at Uganda Clays and Kajjansi Dispensary with no positive result. I had already spent around 15,000 shillings on boda boda fares and could not afford to lose any more so I gave up my quest to vote. Nakitende Jackie, is another voter’s card holder that missed voting. She checked three polling stations without any luck of finding her name before also giving up. While this is the experience of a few we have talked to, there are many more out there who had a similar experience but have nowhere to voice their complaint. Some politicians expressed their fear to the Electoral Commission ahead of the polling day. “I am writing to express my disappointment at the way you have handled my correspondences to your office and to report gross violation of electoral laws, to which you are aloof. It is now five hours into the polling day and despite an earlier correspondence of mine to your office, in which I sought explanation on the omission of the polling stations in Misindye Parish and Seeta Ward on the packing list, you have not responded. Many of my supporters have been turned away from polling stations because their names don’t feature in the registers even when the Electoral Commission’s SMS system states that they fall under the polling stations in question. Electoral Commission Publicist Paul Bukenya told the Kampala Dispatch that it was not disfranchisement but technical removal of double or multiple entries on the register which led to the problems, especially for those that transferred polling stations. “The Commission gave everybody who was eligible to vote the opportunity to register and thereafter displayed the voter’s register for people to confirm including the electronic mechanisms we employed. The commission is satisfied that we did our best to enable eligible Ugandans to vote,” said Bukenya. Bukenya said there are cases of people that registered twice and were removed from one area. He guessed that these people probably turned up in one area yet they are on the register elsewhere. “We had a complaint desk in every area and there were cases that could be solved immediately and those that were deferred. What happened is that for those that transferred civic areas and did not fill transfer forms, their names were retained at the original place of registration,” Bekenya explained. He said another problem was the reluctance by some people to check their status during the times when the Electoral Commission displayed the registers. “We gave a chance to all to check with the registers between May and June last year, some people did and others did not. After that time we then compiled the final register which we displayed in the villages for 21 days,” explained Bukenya. However, on close examination from the Data Centre at the Electoral Commission there is a possibility that some people could have been issued more than one voter’s card. For my case, I learned from the Data Centre that another card was issued in my names and details as per my first registration in Kansanga Our Lady of Mount Camry Polling station in Kampala District. Hypothetically despite my transfer from Kampala District in 2005, my name has remained at the Kansanga Our Lady of Mount Camry in Makindye where the first card was issued. 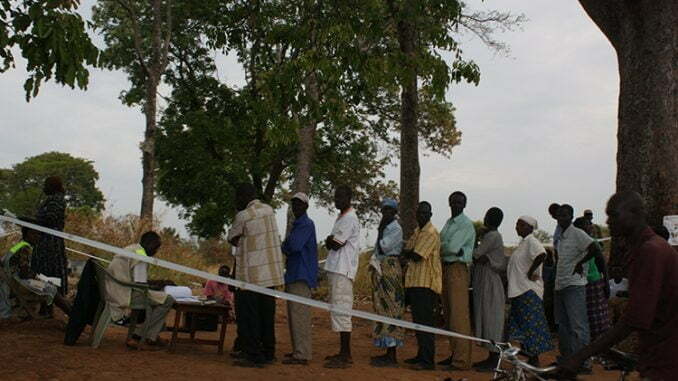 The Electoral Commission staff in the data centre explained that this happened due to failure by the officials at the polling station to offer transfer forms to people in the transfer category to fill in. “Please come back after April 7thwhen the elections are over then we can effect the transfer and issue you with a new card,” came the advice from a staff from the data centre. I guess I will use the next few years to make sure that my voting credentials are in order. It was disheartening not to vote this year having voted in each election since 1996. But in 2016 I will be ready and properly credentialed. I hope.